The idea of having the ag class grow pumpkins at the FFA Land Lab located south of Searsboro was brought up by Mrs. Tara Conover, K-12 art teacher, when she walked through Mr. Brian Lowry’s horticulture class. Conover asked Lowry, vocational ag teacher and FFA advisor, if he would grow the pumpkins for the high school art program’s annual sculpting project. Lowry jumped on board and worked with Conover to get plans in place. They decided to use test seeds instead of normal seeds to achieve a thicker-walled pumpkin, which is better for sculpting. The nearly finished sculpted pumpkin of Mrs. Tara Conover, K-12 art teacher, sits in front of pumpkins being worked on by Nate S., Tyson V. L., and Allison R.. In years past, Conover got the pumpkins for the sculpting project from various places and through community donations. The donated pumpkins, however, didn’t measure up to the giant pumpkins grown at the FFA Land Lab this year. 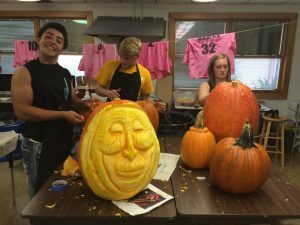 “Having bigger pumpkins makes it easier to work on, and we really appreciate the FFA,” said senior Haley James. Conover liked the school’s involvement because the pumpkins were ideal for the sculpting project, making it easier for the students. “I don’t have to go find pumpkins, also the ag department gets a good learning experience. They did an amazing job,” said Conover. The seeds for the giant pumpkins were ordered by Lowry from Burpee, a home and garden website that sells seeds and plants. Conover chose three different varieties, with some turning out better than others. The project started off as a student-directed project, but Lowry took on all of the growing responsibilities. He planted the pumpkins the second week of June, watered the patch a few times, and weeded four times over the summer. The inaugural pumpkin harvest yielded over 30 pumpkins of many different sizes. Lowry and students from his Ag I and Ag Applications Classes picked the pumpkins the last week of September. Over the course of a week, Conover guided nearly 40 high school art students as they carved, painted, or sculpted the bright orange globes into various pieces of art. “They were allowed to use any art process from sculpting, scratching, carving, and even painting. We had students do about every process,” said Conover. A bonus to the activity was disguised in the gooey, stringy mess dug out of the pumpkins – hundreds of seeds were dug out, cleaned up, and Conover spent the wee hours of the night roasting the fall treat for students to enjoy in class. Conover estimates she prepared approximately 35 cups of seeds this year.